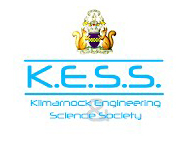 Kilmarnock Engineering and Science Society (KESS) exists to promote public engagement with engineering and science in Kilmarnock and District. On Tuesday 5th March 2019, the Lord-Lieutenant of Ayrshire, Sheriff Iona McDonald presented Professor Danny Gorman with his insignia as an officer of the Order of the British Empire (OBE). The ceremony took place at Grange Academy, Kilmarnock as part of an evening with the Kilmarnock Engineering and Science Society (KESS).